This is going to read like a eulogy. Although the NHL will insist on going through with the formality of playing Game 5 Friday night at Nashville, the first-round series effectively ended with the Predators’ 3-2 win over the Avalanche in Game 4. 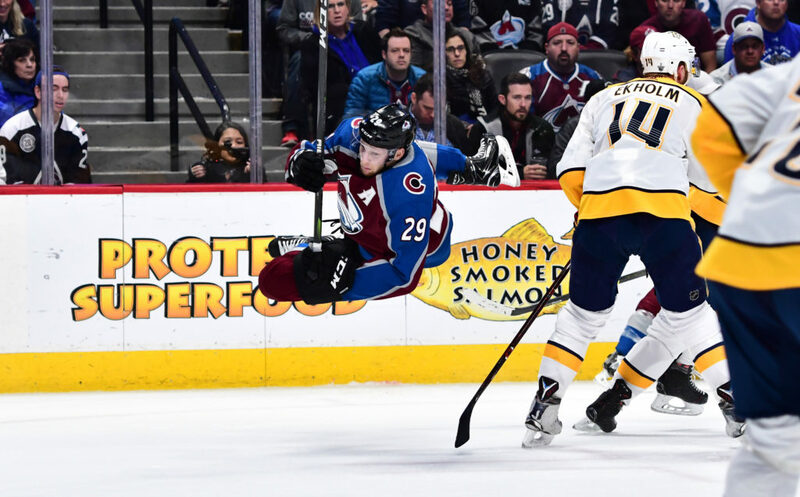 That’s not an attempt to contrive controversy, to generate outrage, to bring on lectures that the Avalanche is being sold short — especially given that Colorado came back from a 3-0 deficit after two periods to make the pivotal Game 4 interesting again. On the contrary, this is about giving the Avalanche credit for a surprising season, and for nearly doubling its point total after a historically horrific 2016-17. Plus, this is a concession up front that Colorado would have had a shot in this series with Semyon Varlamov in the net and Erik Johnson on defense … but not without. Think of the Predators without Pekka Rinne and P.K. Subban. It is reasonable to ponder it as a bit of comparative whimsy, not as an alibi or rationalization. The Avs missed Johnson and as Varlamov’s stand-in, Jonathan Bernier hasn’t been up to the standards of the postseason. Plus, he left the game late in the second period Wednesday night with a lower body injury. Afterwards, Nathan MacKinnon, who had five shots on goal on a pointless night, was more frustrated than angry. “We had a good third, obviously,” MacKinnon told me in the Avalanche dressing room as the mob went elsewhere. “The first 40, they came out way better than us and they deserved to win. . . We heard them say they wanted to have a good start after they didn’t have a good start in Game 3. They definitely did that. The defining moment in Game 4 was when Filip Forsberg outmaneuvered Avalanche defenseman Duncan Siemens and beat Bernier for the first goal of the night at 15:33 of the first period. Siemens, who has spent most of his pro career in the AHL as an Avalanche farmhand, is much-liked and respected for his professionalism and perseverance, but the fact that he was in the lineup as part of the patchwork D corps in the wake of the injuries to Johnson and Samuel Girard was telling. Plus, his failure to come even close to living up to expectations that go with being the 11th overall choice of the 2011 draft was the leading edge in the argument that the Avalanche hadn’t drafted well, especially on defense, for several years leading into the Joe Sakic–Patrick Roy partnership. This team has reinvigorated Denver as a hockey market. It has built excitement for the future to the point that next season’s standards and expectations will be much higher, ensuring that making the postseason won’t be viewed as an accomplishment as much as it will be a must. That’s the situation the Predators, last season’s No. 8 Western Conference payoff seed before storming through to the Stanley Cup Finals, found themselves in this season. It was a factor in the win-now mode that was at play in the three-team deal that sent prospects Girard and Vladislav Kamenev plus a second-round pick move from Nashville to Colorado. Terry Frei of the Greeley Tribune writes two commentaries a week for Mile High Sports. He has been named a state’s sports writer of the year seven times, four times in Colorado (including for 2016) and three times in Oregon. He’s the author of seven books, including the fact-based novel “Olympic Affair,” about 1936 Olympic decathlon champion Glenn Morris, and “’77: Denver, the Broncos, and a Coming of Age.” His web site is terryfrei.com and his additional “On the Colorado Scene” commentaries are at terryfrei/oncolorado.